Please bring any ideas or suggestions for future programs to the next meeting. Your input would be greatly appreciated. Be sure to tell friends and acquaintances about the Round Table. I am always surprised that often people have an interest in the Civil War and know nothing about our organization. Our next speaker is an old friend of the Roundtable, Marshall D. Krolick, who enlisted in the Chicago Roundtable in 1961 where he served as President, Editor of the Newsletter and in 1985 was awarded an Honorary Life Membership. His topic will be: Brandy Station. The Making of the Movie Gettysburg was presented by Patrick Falci, actor and performing historian. He portrayed A.P. Hill in the movie. Patrick Falci always gives a mesmerizing program as he did last year portraying AP Hill. Patrick was historical advisor for the movies Gettysburg and Gods and Generals that were written and directed by Bob Maxwell. In addition to the historical research and supplying photographs of the era, Patrick scouted out locations in Maryland for the films. Patrick took Maxwell on a Stonewall Jackson tour of Civil War battlefields and other historical sites. Patrick played Rough Rider #2 in producer/actor Tom Berenger’s film of the same name. He, served as Jeff Shaara’s historical advisor, and provided research and tours of Civil War sites portrayed in his books. Patrick vetted John Jakes’s manuscripts for On Secret Service and Charleston, at its editor’s request. Because Mr. Falci did not provide us with a written transcript of his presentation, we were forced to give a brief synopsis in this newsletter. This is a good time to ask readers of this communications vehicle if you would volunteer to be the recording secretary. As media director, I will take the story from there and turn it into both the printed and website version of the newsletter. 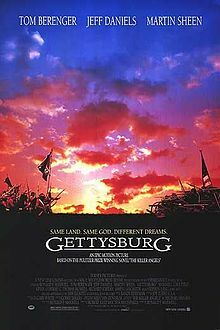 The movie Gettysburg was released in 1993. It was the film representation of the book Killer Angels by Michael Shaara. But the story of Patrick Falci and the movie really go back to 1964. At that time young Patrick was taken by his family to the Gettysburg battlefield. While walking the ground he fell in love with the history and vowed to return some day. The book, Killer Angels, came out in 1974 and was awarded the Pulitzer Prize for Fiction in 1975. Sadly, the book did not sell well. It was, however, given to Ron Maxwell a year later. Maxwell thought the story had the seeds for a movie, so the stage was set for a 17 year gestation period. Needless to say, that tale had many twists and turns, which provided the material for Mr. Falci’s presentation. In 1980 a first attempt was made to bring the film to life. Maxwell’s idea was to produce a low budget film in eastern Europe starring, perhaps Marlon Brando or Charlton Heston. This concept had star power, but there was no way it could have a cast of thousands and be true to the historical detail. It went nowhere. 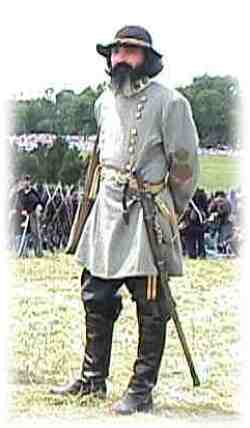 In 1986 6,000 Civil War reenactors did the 125th anniversary of the battle of Shiloh on site at Pittsburg Landing. This lead to the prospect that reenactors could provide “mass” for a full length movie at the site where the battle took place. With certain conditions, about 12,000 reenactors agreed to work on the project with Maxwell in 1988. About this time Michael Shaara died. Fortunately, both Patrick Falci and Ron Maxwell were based in New York City. They met when Maxwell was once again casting for actors. Patrick, who had been playing AP Hill, applied for the part. He had plenty of acting skill, such that when he was given a script to read, he memorized it. He played the part so well he was given the role. The movie did not have a large part for AP Hill, so Patrick did not really face “big name” competition. It allowed him to strike up a relationship with Maxwell and Michael Shaara’s son Jeff. In 1990, the project fell apart for the second time, but was revived only to fail for the third time in 1991. However, interest in the Civil War was growing. ABC did a drama about Custer. Ken Burns had a blockbuster hit with his documentary. Ted Turner showed interest for something for his TNT network. He kicked in $12,000,000, 5,000 reenactors agreed to man the battle scenes, and the Gettysburg battle field agreed to allow 26 days of filming on site. The project under went a name change as Killer Angels sounded too “biker” for the marketing folks. So, the film title was changed to Gettysburg and the movie finally began to take shape. When it started the film was only to be a mini-series for TNT. Turner through in another eight million dollars to give the project the “full Hollywood” treatment. It was about this point that Patrick and Jeff Shaara became good friends. A long list of stars were asked about playing the lead. The team asked Robert Duvall, Paul Newman, John Voight, James Garner, Richard Harris, George C. Scott, and Martin Sheen. The pick of Sheen to play Lee was not without its problems. He had problems with his horse and the warm temperature in a wool uniform. Being dyslectic, he had issues learning his lines. Tom Berenger, who played Longstreet, even helped out by writing the line “and Hill will support” on the map. This can be noticed in the final cut if you look carefully.